There may be as many ways to bake a brisket as there are cooks preparing the meat for a Passover Dinner or any other time of year.. The one I’m sharing here is rooted in a very simple method used by my late mother. I doctored it through the years and evolved it into this one, which I wouldn’t change. My son, Lloyd, however, has changed it into a recipe of his own. I don’t think any home cook has ever said someone else’s recipe was better than their own, but I freely admit many of the changes I made to arrive at this one were adapted from ideas shared by friends. We don’t do big holiday dinners at home the way we once did. Time and the inexorable march of events have deprived us of many of those who once gathered at our place to laugh, love, eat and celebrate Passover, Thanksgiving, or other similar events. Mom and dad and my two sisters are gone, claimed by various forms of cancer. Our sons have moved away to raise their own families. The times when I would spend the entire day preparing the dinner for as many as 25 relatives and friends are long gone. I miss those days in the kitchen, the satisfaction that came from managing my time to have all the multiple courses and dishes done on schedule. I think I may miss the kitchen time spent preparing the meals as much as the gatherings themselves. 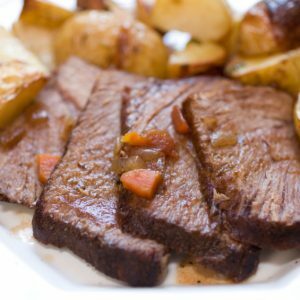 Mom’s brisket recipe was simple: put the meat in a roasting pan, add some water, surround the meat with carrots and onions, cover and bake at 350 degrees for 2 ½ hours. She always bought quality meat, so it turned out enjoyable every time. My first change came decades ago, when I decided I should sear the beef in some oil before it went into the roasting pan. Then I decided to slice the onions, brown them and put them on top of the beef. A butcher contributed the idea for the paprika. I read a recipe somewhere that used beer instead of water, so I tried that for a few years, until a friend said she preferred red wine instead of beer. I borrowed the notion for scrubbing but not peeling the carrots from a beef stew recipe I found and later added the celery because it sounded like a good idea. Here’s what I came up with. 2 carrots, scrubbed but not peeled, cut diagonally into chunks. Trim some of the surface fat from the meat, but leave a thin fat crown. Heat the oil in a large frying pan. Sear the brisket on all sides in the hot oil. Remove the brisket to a roasting pan with a tight cover. Sprinkle the brisket generously with paprika. Cover the brisket with the onions. Surround the brisket with the carrots and celery. Add the water and wine without washing the paprika from the meat. Cover the roasting pan tightly, and bake the brisket in a preheated oven at 325 degrees for 2 1/2 hours. Remove the brisket to a carving platter, cover the meat loosely with tinfoil, and let it stand 10 to 15 minutes so the juices can set. Do not remove the onions. With a sharp knife, slice the beef across the grain. Hint: If the cover of your roasting pan doesn’t fit tightly, it’s a good idea to check the pan every 45 minutes or so to make sure the liquid hasn’t cooked away. Add more water if needed. Or you can seal the top of the pan with tinfoil to form a tighter seal and then place the cover over the foil. I like to wrap the brisket in tinfoil after it’s cooked. Then I put it in the refrigerator overnight and slice it the next day. It slices easier after it has cooled. After slicing it, I wrap it in tinfoil again. When I’m getting close to serving time, I reheat the brisket in a 325-degree oven, still wrapped in the tin foil. It will take about 30–40 minutes to heat through. Loosen the tinfoil the last 15 minutes and separate the slices with a fork to allow the heat to penetrate. By doing this, you will avoid a last-minute rush of carving the meat. You just need to unwrap the meat and put it on a serving platter. For a gravy, remove the solids from the roasting pan and pour the remaining liquid into a large measuring cup. Refrigerate overnight and skim the congealed fat the next day. Add some sliced carrots and onions and boil the mixture for about 30 minutes. Then hit it with your emersion blender, taste it to adjust the seasoning, thicken it slightly and it’s done. You also could quarter some white rose potatoes and cook them in the gravy for 30 or 40 minutes. Just remove them before blending in the carrots and onions. Serves well with mashed or roasted potatoes and green beans.